Pathway to Paris is an initiative that highlights solutions to climate change, to help make the Paris Agreement real. We collaborate with musicians, artists, leading thinkers, sustainability consultants, cities and activists. Pathway to Paris works in partnership with the United Nations Development Programme and 350.org. 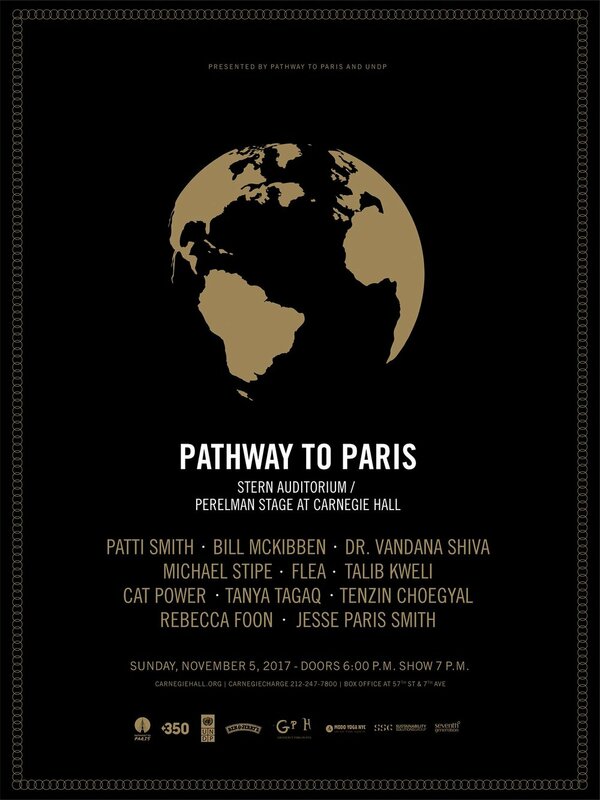 Co-founded by Jesse Paris Smith and Rebecca Foon, Pathway to Paris includes a series of musical events, radio shows, and initiatives, drawing upon proven examples to demonstrate that on a city level significant reductions in GHG emissions is necessary and possible. Together cities can turn the Paris Agreement into action. At this event, Pathway to Paris announced a new initiative called 1000 cities, inviting all cities of the world to transition to 100% renewables by 2040. All proceeds from the event were donated to 350.org, Pathway to Paris, and the UNDP. All proceeds from this event go to 350.org and the United Nations Development Programme. Featuring Thom Yorke, Patti Smith, Flea, Warren Ellis, Tenzin Choegyal, Jesse Paris Smith, Rebecca Foon, Vandana Shiva, Bill McKibben, and Naomi Klein. Featured musical performances from David Johansen with Mercury Rev, Martha Wainwright, Nicole Atkins, Bill McKibben (350.org), Xylouris White, Lucy Wainwright Roche, Suzzy Roche, Techung, and Jesse Paris Smith & Rebecca Foon. The event called on world leaders to quickly turn climate commitments into action. Anne Waldman and Fast Speaking Music (Ambrose Bye, Devin Brahja Waldman) Thurston Moore, AroarA, Brad Barr (The Barr Brothers), Sarah Pagé (The Barr Brothers), Jesse Paris Smith and Rebecca Foon. WNYC’s Spinning On Air joined Pathway to Paris to present “Spinning On Earth”, an evening of music and discussion around climate change. Host David Garland welcomed poet Anne Waldman; singer, writer and poet Patti Smith; executive director of 350.org May Boeve; composer Jesse Paris Smith and cellist Rebecca Foon. Featuring Bill McKibben, Anne Waldman, Patti Smith, Lenny Kaye, Michael Stipe, Thurston Moore, Steve Shelley, David Garland, Terre Roche, Larkin Grimm, Jesse Paris Smith, Rebecca Foon and The Down Hill Strugglers. This event was the first in our series to raise consciousness and funds for progressive climate action in the lead-up to the 2015 United Nations Climate Change Conference in Paris.